Dear members of the Circolo San Pietro! I greet you all cordially and thank your President General, Duca Leopoldo Torlonia, for his words. I extend my appreciation for daily service to the most disadvantaged people in the city. The Circolo San Pietro for many years is a beautiful reality of assistance and help to the poor: a branch of the rich and fruitful "life" of charity, expression of the ecclesial "vineyard" of Rome. You strive to be the face of a Church that pushes boundaries, which never stops, but walks to meet the brothers and sisters who are hungry and thirsty for listening, sharing, closeness and solidarity. I urge you to continue on this path! In your activity, do not be ashamed of the wounded flesh of your brother, but in every suffering and needy person know how to see the face of Christ. Be courageous missionaries of Christian charity and do not tire of bearing witness to the mercy and goodness of God, becoming instruments of consolation for many fragile and desperate people. You have before you the example of many saints of charity, already beatified or canonized; but let yourselves also be stimulated "by the signs of holiness which the Lord presents to us through the humblest members of that people who also participate in the prophetic office of Christ by spreading the living testimony of Him everywhere, above all through a life of faith and charity "(Apostolic Exhortation Gaudete et exsultate, 8). Your apostolate is an occasion and an instrument to correspond to the call to holiness that the Lord makes to each one of us. Through the works of charity, you allow the grace received in the Baptism to fruit in a journey of holiness, which is the fruit of the action of the Holy Spirit in our life. 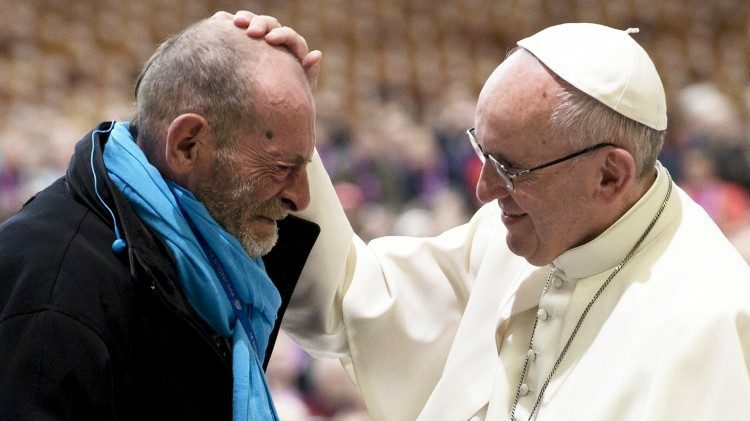 I thank you also for the Obolo di San Pietro, which you collect in all the churches as a sign of your participation in the solicitude of the Bishop of Rome for the poverty of this city. Your valued charitable activity is always supported by prayer and constant reference to the Word of God, the light that illuminates our path. I entrust you, your relatives and your mission to the protection of the Blessed Virgin, the Salus Populi Romani, and to the intercession of Saint Peter and Saint Paul. I ask you to continue to support my ministry also through prayer, and I warmly bless you. Thank you.